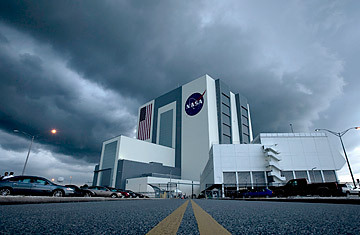 In this photo provided by NASA, storm clouds roll over NASA's vehicle assembly building moments after the lauch of space shuttle Endeavor was scrubbed at Kennedy Space Center in Cape Canaveral, Fla., Sunday, July 12, 2009. The best time to do a little renovating is when everyone is out of the house  something homeowners know and something NASA appears to appreciate too. The space agency is experiencing empty-nest syndrome in a big way, with the shuttles heading for museum retirement and the next manned American space vehicle not scheduled to fly until 2016  unless it's 2018 or 2025 or who knows when? That leaves the huge and now-vacant vehicle assembly building (VAB) quieter than it's been since it first opened its 45-story doors in 1966. With half-century old cables snaking behind its walls, aging electronics running the cranes overhead and leaky plumbing feeding the heating, cooling and water systems, it's crying out for a little This Old House love. And now it's going to get it. The VAB's gross dimensions were headspinning in 1966  and still are. The iconic old building is 526 ft. tall, by 716 ft. deep by 518 ft. wide (160m by 218m by 158m). It has more than 129 million cu. ft. (3.6 million cu. meter) of space. In the changeable Florida climate, it even has its own weather, with tiny cloud-like formations sometimes gathering near its ceiling. The foundations for the building go 160 ft. (49 m) deep. All that space was necessary because the VAB was built to accommodate the massive Saturn V rocket  363 ft. (111 m) tall and made up of three stages, plus an escape tower. The stages would be lifted and stacked on top of one another, and a massive crawler would then take the completed booster on its 3.5 mi. (5.6 km) journey to the launch pad, moving at the decidedly patient clip of 1 mph (1.6 k/h). Booster and crawler together weighed so much that the gravel that lined the path underneath would be crushed to powder as they passed. After 1973, when the last Saturn V flew, the VAB was retrofitted for its far longer career as an assembly hangar for the 184 ft. (56m) shuttle. But last summer the shuttle program came to an end, and NASA has begun work on a new Saturn-like  and Saturn-sized  booster known prosaically as the space launch system (SLS). The SLS is planned to be a sweet-looking machine, but given NASA's depressing history of start-stop projects, plenty of people are convinced it will never fly. "Yes, there will be budget cuts. Yes, it will be stretched out. Yes, it will have problems. Yes, it will fall apart," space policy consultant James Muncy told the New York Times when the SLS design was unveiled in Sept. 2011. Even William Gerstenmaier, NASA's associate administrator for space operations, could offer no more than a qualified forecast when he spoke to Time: "We've put this together to make sure we can accommodate small budget changes over the years. The architecture and design have as low a technical and development risk as possible. We're going to give this a good run." One key to that run is being ready for the rocket if it's ever built, and so the VAB is undergoing a floor-to-attic overhaul. About 13 mi. (20 km) of copper cabling have already been removed, with another 37 mi. (56 km) to go. All of it will be replaced by pinky-width fiber optic cables. The five overhead cranes, which can lift up to 350 tons (317 metric tons), are still sound, but their electronics and other controls will be ripped out and replaced. Spigots and pumps for the fire control system  which was up to code in 1966 but falls short of modern standards  will be removed and replaced next year. Most important, the seven fixed work platforms that are attached to the walls at different heights and were built for the Saturn V will be replaced by 10 new ones that can be repositioned as needed. That's critical in an era in which NASA plans to lean on private contractors like Elon Musk's SpaceX to get humans and cargo to and from low-Earth orbit, while the SLS is used principally for deep space exploration. Such a variety of launch vehicles requires flexibility; if you don't know exactly what rocket you'll be assembling on any one day, after all, you'd better be able to accommodate them all. Even so extensive a renovation will not take all that long. Since the VAB structure itself is sound, engineers expect to complete their work by 2014. The effort they expend between now and then will make things that much sweeter if the new rockets actually show up  and that much more forlorn if they don't. VIDEO: 30 Years of the Space Shuttle: What Now?